New shop for tea towels! Its been a little over a year since I started working with repeating botanical patterns and printing my botanical photos on tea towels. I’ve experimented and tweaked and thoughly enjoyed creating these images and patterns. I’ve added designs featuring sweet peas, anemones, ginkgo leaves and more. I’ve sold them at craft fairs and had customers email me to ask for more, so now, I’m delighted to let you know, they’re now all available here on Roostery. If you don’t know Roostery, its the companion site to Spoonflower. Offering finished goods from all manner of custom printed fabrics, Roostery is so much fun! And no, this is not sponsored, I’m just a fan. I hope you’ll go take a look! Did you know that February is American Heart Month? I didn’t, but when I found out, my own family’s experience with congenital heart defects (a form of heart disease) came flooding back to me. One of my sons was born with a congenital heart defect, a very large VSD, or ventricular septal defect; a hole between the two bottom chambers of his heart. Though the VSD is the most common type of congenital heart defect, and often heals on its own, his was exceptionally large, and his VSD didn’t heal. By the time he was 2 months old, his breathing was labored, and he stopped growing. At three months old, he had his first open heart surgery. He bounced right back, growing and thriving in the following year. But still, he developed a “thrill” or, a heart murmur so significant, it was visible as a small shudder on his tiny chest. Within a year, it was clear he would need another open-heart surgery to repair the structure of his heart, so he was back in the operating room at 16 months. He’s now 16 years old, grown tall, healthy, and too old to want his current photo on his mother’s blog. Its easy now to forget that he had a rocky start in life, though he carries a long scar down the center of his chest, and two Dacron patches have become part of the structure of his heart. Reflecting on that time of hospitals, medications, and anxiety, I’m flooded by so many emotions, but mostly gratitude. I’m grateful for the care he received, that we were able to afford it, and to live in a time and place where saving babies born with congenital heart defects is not only possible, but routine. In gratitude for all these gifts and hopes of helping others experience such positive outcomes, I want to use paper hearts to help people’s heart. For the entire month of February, Bottle Branch will donate 20% retail sales to support Congenital Heart Defect Research though the American Heart Association and the Children’s Heart Network. There are still harder cases, new techniques to be developed, babies, children and adults in need of life-saving surgeries. As a thank you to those supporting this donation with your purchases, I’ll be giving a free (free!) set of heart gift tags (pictured at the top) to the first 10 orders over $20, starting today. You can read more about congenital heart defects here. You can read more about American Heart Month here. I’ve written about how my training as a botanist influences the way I see plants, but I haven’t shared much about how my work in environmental science influences my decisions at Bottle Branch. As someone who once studied carbon dynamics in forests and taught environmental science, I can’t ignore issues of sustainability. In packaging my cards, sticky notes, stickers, gift tags and notepads, I use clear wrappers that are made from compostable material. They work like plastic and look like plastic, but the clear wrappers I use are made from PLA (polylactic acid) which is derived from plants, not petroleum. They’re a bit more brittle that petroleum-derived plastic, and far from perfect, but they’re biodegradable and renewable. You can read more pros and cons of PLA here and about the biodegradability of PLA here. All my cards are printed on Forest Stewardship Council (FSC) certified card stock with between 30% and 100% recycled content. What does FSC certification mean? In short, it means the pulp used to make these papers comes from responsibly managed forests. You can read more about Forest Stewardship Council ceritfication here. In choosing these card stocks, I hope to support both responsible foresty practices and the market for recycled products. (3) Home grown, pesticide free plant material. Its no secret that I like to garden and to use those homegrown plants and flowers for my art work, because, well, it’s fun! But homegrown plants are also a more sustainable choice – no pesticides, herbicides, synthetic fertilizers or long distance transport. When I do buy flowers, I prefer to buy from local, sustainable flower farms like Five Fork Farms. (4) Recycled Paper bags, mailers, and tissue paper. Every order I pack is wrapped in tissue paper made from 100% recycled fibers and shipped in a recycled kraft paper mailer that is made in the USA. Or, if its a local purchase, its delivered in a recycled paper bag. It helps that they’re appealling to the touch and the tissue paper is pretty! I wish I could write more. I wish I could say all the printing was done using wind or solar power. Or deliveries would be done only in electric vehicles. But in trying not to dwell on all of the other things I could/should be doing to be greener, I’ll remind myself “Don’t let perfect be the enemy of good” and keep on finding little things to do to keep my business fresh and green. If you’ve been around here long, you’ll know I’ve been interested in repeating patterns and spoonflower for a while. So, when the winter doldrums hit this year, I dug into my stockpile of plant photos and made some botanical designs. The next step was to take them to spoonflower, where patterns can be printed onto gift wrap, fabrics, and wallpaper. The pink tulips pattern might be a cry for help from this mother of four boys, but if I had a little girl, I would be tempted to stick some of this wall paper in her room. From Spoonflower, I took my patterns over to its sister site, Roostery, which makes finished goods from Spoonflower printed fabics, including, napkins, sheets, pillow covers, and of course, the tea towels you see here. It was a thrill to received these tea towels and see my patterns on a finished product. I have no plans to offer them through my online shop, but if you have a hankering for botanical textiles, they are available to order at roostery. Likewise, visit spoonflower if you are interested in fabric, giftwrap, or wallpaper. I’m hoping to make more patterns, but I’m also starting to think about spring, and planning and planting my garden and once, there are real flowers to play with, who knows what will be next?! Happy December, my friends. Are you rushing around trying to get a million things done?! I’ve done my fair share of rushing, but now that its the middle of the month, I’m really trying to breathe deeply and enjoy the season and all its festive details, like luxe ribbons, and fresh evergreens. So, I thought I’d share a few of the seasonal touches I’ve been adding and/or planning at my house. The first decoration I put up was a square boxwood wreath pictured above, in my kitchen. The square shape was new for me, but once I found the right spot in my kitchen, framed by a window and backsplash edge, it felt just right. And, yes, I did spend a little time arranging the oranges, bowl and tea pot for this photo – I couldn’t help myself! Last week, I potted up some plants to give as presents. Its probably no surprise that little potted plants and/or vases of greens and flowers are among my favorite things to give this time of year. I’ve also been wrapping presents like these. It brings me joy to combinte patterns, tie ribbons and put together color combinations, like aqua with red. And it was a bonus when I discovered that my Bottle Branch gift tag matched the David’s Tea ‘Winter Favorites’ packaging in this photo. Next up, I’ll be sending out Christmas cards. It is undoubtedly a bit of work to put them together, but its also so much fun. For me, December is the only time of year where I look forward to the mail. I love hearing from friends near and far and seeing all the creative and pretty cards they create, not to mention family photos. Before I go, I’ll put in a quick plug for my Bottle Branch etsy shop and say that if you want some festive holiday cards, gift tags, sticky notes, and more, shop now. I have plenty in stock but I’ll be shutting it down for the season this Thursday, December 14. Because, obviously, I’ll need more time to create little seasonal touches, like this arrangment of pine cones, which I put together this morning when I was supposed to be finishing up this blog post. Happy December, everyone! Hope you find some time to slow down and enjoy the season! Hellebores are having their moment. With their early bloom time, relative hardiness, and quirky beauty they are proving irresistible to many, including me. Having started with a few typical hellebore varieties a few years ago, I have lately developed that mania for special varieties that sometimes afflicts gardeners. Last fall, I planted Helleborus “pink frost” (above) and it has been astounding, with pink flowers emerging from under snow cover, and blooming, blooming, blooming. I also planted Helleborus ‘Maid of Honor’, which, as you may guess from the name, promises fluffy pink double flowers. Like the rest of my hellebores, its only just now emerging. Fingers crossed it blooms soon! I also fell in love with these double hellebores (below) when I found them (and promptly bought them) as cut flowers. When I posted them on instagram there was a lot of chatter about what variety they could be, with no conlcusion. Only later, when I read this post on collecting hellebores by Pauline of Cloverhome, did I start thinking. At first, I thought they might be Helleborus ‘Cerise’ which she featured in her post. 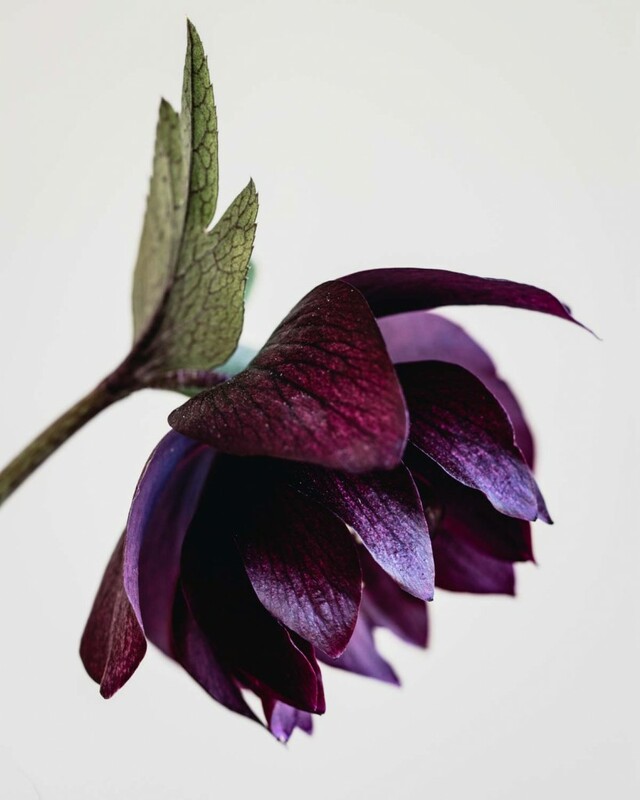 Now, after a little internet snooping (and wondering how quickly hellebore hybrids cross international borders) I am thinking they might be H. ‘Amythest Gem’ or H.’Red Sapphire” (Didn’t I tell you I’ve succumbed to hellbore mania?) Anyone with expert hellebore idenitification skills, please speak up! I also managed to take some photos of these double flowering hellebores for making into a cards (above), now available in my Etsy shop, just in case you, or someone you know, also suffers from hellebore obsession. I’ll be adding to my plant collection this spring, having already ordered more varieties, to be delivered any day now. And I may even add to my hellebore photo card collection once my homegrown plants bloom. Spring is such a heady time for plant lovers, isn’t it?! Hope you are enjoying yours!